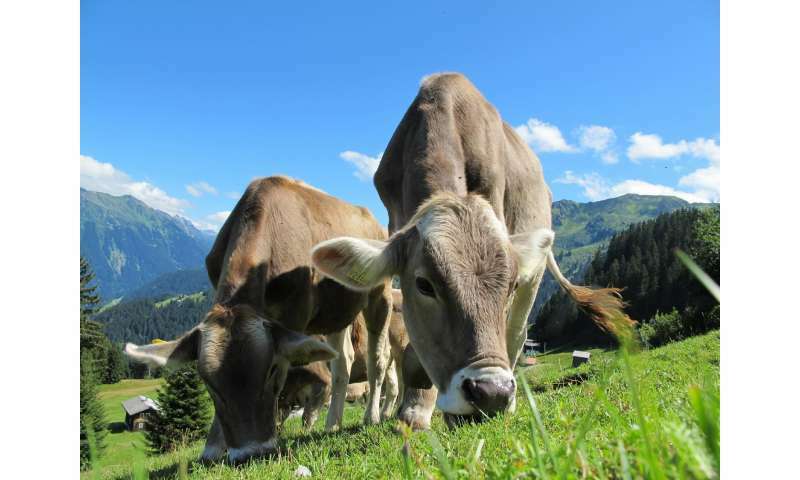 The livestock sector could use almost half of the 1.5 degree C greenhouse gas emission budget allowed by 2030, so addressing this should be a key part of the strategy to hit climate targets, according to a new study published in Climate Policy. Dr. Helen Harwatt, farmed animal law and policy fellow at Harvard Law School, advises that getting protein from plant sources instead of animal sources would drastically help in meeting climate targets and reduce the risk of overshooting temperature goals. 1)	Acknowledging that current numbers of livestock are at their peak and will need to decline ('peak livestock'). 2)	Set targets to transition away from livestock products starting with foods linked with the highest greenhouse gas emissions such as beef, then cow's milk and pig meat ('worst-first' approach). 3)	Assessing suitable replacement products against a range of criteria including greenhouse gas emission targets, land usage, and public health benefits ('best available food' approach). Harwatt further elaborates that recent evidence shows, in comparison with the current food system, switching from animals to plants proteins, could potentially feed an additional 350 million people in the US alone. The article reports that the current livestock population in the world is around 28 billion animals and constitutes the highest source of two major greenhouse gases—methane and nitrous oxide. The production of methane in particular is troublesome, as it has an 85 times greater global warming potential than carbon dioxide over a 20-year time frame. Methane emissions from the livestock sector are projected to rise by 60 percent by 2030—the same time period over which strong and rapid reductions are needed. "Given the livestock sector's significant contribution to global greenhouse gas emissions and methane dominance, animal to plant protein shifts make a much-needed contribution to meeting the Paris temperature goals and reducing warming in the short term, while providing a suite of co-benefits," Harwatt says. She adds, "Failure to implement animal to plant protein shifts increases the risk of exceeding temperature goals and requires additional, and unrealistic, greenhouse gas reductions from other sectors. The current revision of national contributions to meeting the Paris Agreement from 2020 onwards should ideally integrate animal to plant-protein shifts. As a next step, the COP24 in December this year provides an excellent opportunity for policy makers to start this important conversation." The article acknowledges establishments, such as businesses, can spearhead these efforts. As an example, Dr. Harwatt is already putting her three-step animal to plant protein shift approach into practice in the food service sector in her role as Sustainable Food Policy Advisor to charity Humane Society International UK (HSI). HSI run the Forward Food programme providing free plant-based culinary training for public and private sector chefs. Here, Dr. Harwatt can, and other experts could too, assess food-related greenhouse gas emissions at the institutional level and apply the three-step strategy to identify opportunities for emissions reductions through peaking purchase of animal products, tackling the 'worst first' and replacing them with best available foods. She comments, "The food sector is already making progress on these issues and demonstrating that it's commercially viable to incorporate animal to plant protein shifts. We need policy makers to enable the creation of Paris-compliant food systems on a much larger and faster scale—and animal to plant-protein shifts play a key role". Cavemen still eat meat. The evolved men grow grains.